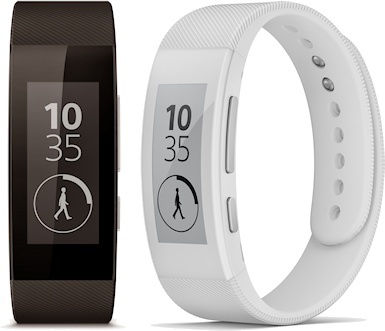 Two new wearable devices, the Sony SmartWatch 3 and Sony SmartBand Talk serve similar markets in very different ways. While the SmartWatch 3 is an Android Wear device, much like many rivals that seem to be appearing, the SmartBand is a much simpler device which actually makes it rather more interesting. There's no doubt that smartwatches are the current in-thing (at least with manufacturers), but Sony have been at this for a while (as you can tell from the name). This is the first Sony smartwatch to run Android Wear, a platform specifically designed for wearable devices such as this. The Smartwatch 3 features a 1.6" transflective 320 x 320 pixel display, has a quad-core 1.2GHz ARM A7 CPU with 512MB of RAM and 4GB of flash memory, is IP68 rated against dust and water, supports both NFC and Bluetooth 4.0 and it comes with a bunch of sensors including GPS, a compass and accelerometer. 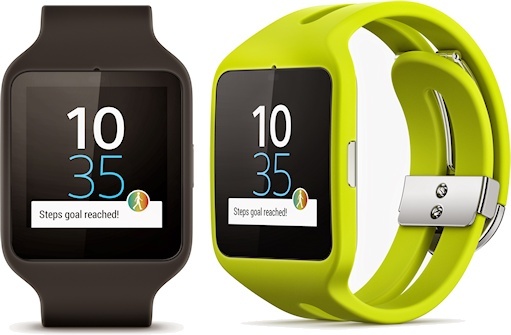 Inside is a 420 mAh battery (quoted as giving 2 days normal use), and the Smartwatch 3 weighs 45 grams. It should work with any phone running Android 4.3 or above. It isn't a bad looking device, but the physical design does look a bit out of date compared to smartwatches such as the LG G Watch R, Samsung Gear S and Motorola Moto 360. The SmartBand Talk is a classified as a lifelogger rather than a smartwatch, but unlike some other similar bands this one can make voice calls (via your mobile), it also displays notifications and comes with an alarm clock. Both this and the Smartwatch 3 support Sony Lifelog, an Android application that records where you are and to an extent what you were doing. The display is a 1.4" 296 x 128 pixel e-ink panel that is nicely curved, rather than the flat screen on the Smartwatch. The low power requirements of this device means that it can function for three days on a tiny 65 mAh battery, and the whole thing weighs a mere 24 grams, half that of the SmartWatch. This is also an IP68 rated device with Bluetooth 4.0, but in this case you will need an Android 4.4 device to go with it. Unless you need the full functionality of a smartwatch, then the SmartBand Talk looks like a more lightweight (and probably cheaper) alternative. Sony say that both devices should be available during the Autumn although no guidance was given on price.